This walkie pallet truck manages loads up to 3,000 lbs.with ease. This electric pallet jack is perfect for light manufacturing, grocery and delivery applications. It’s easy to use and handle with its steering and control handle that was designed with the operator in mind. 24-Volt permanent magnet DC drive motor increases efficiency and duty cycle. Parking brake is automatically applied when truck stops and handle is released. Lift cylinder has durable, chrome-plated lift rod provides smooth lifting and lowering. 70Ah (AGM) absorbed glass mat battery pack for extended run times up to 4.5 hours. Standard 110V three-prong outlet plug for convenient charging. Quick disconnect EPD power cut-off, hour meter, and battery discharge indicator all come standard. 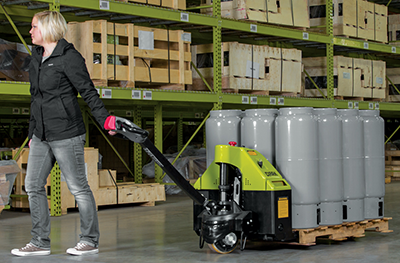 Crawl speed function allows the operator to use the pallet truck with the handle at a 5° back-tilt from vertical position so to maneuver in tight dock areas. Solid steel tubing arm and handle designed to outlast cast aluminum or plastic designs. Operator can control travel, lift and lower functions without having to lift a hand from the handle. Angle grips are designed to allow easy operation with either hand. Wrap around steel guard has a reversing switch, thumb control, and horn that are standard. Minimum steering effort is featured with the low mounted tiller arm that offer excellent operator comfort. Gas assisted spring handle gently returns handle to vertical position. The steer handle at a 5° back-tilt from vertical position operator has ease of use in tight areas under the crawl speed function.